اسدی, آذر, زینتی زاده, علی اکبر. (1394). بهینه‌سازی فرایند تصفیه بیولوژیکی فاضلاب شهرک صنعتی در راکتور زیستی ناپیوسته منقطع با هوادهی متناوب. مجله آب و فاضلاب, 25(5), 2-12. آذر اسدی; علی اکبر زینتی زاده. "بهینه‌سازی فرایند تصفیه بیولوژیکی فاضلاب شهرک صنعتی در راکتور زیستی ناپیوسته منقطع با هوادهی متناوب". مجله آب و فاضلاب, 25, 5, 1394, 2-12. اسدی, آذر, زینتی زاده, علی اکبر. (1394). 'بهینه‌سازی فرایند تصفیه بیولوژیکی فاضلاب شهرک صنعتی در راکتور زیستی ناپیوسته منقطع با هوادهی متناوب', مجله آب و فاضلاب, 25(5), pp. 2-12. اسدی, آذر, زینتی زاده, علی اکبر. بهینه‌سازی فرایند تصفیه بیولوژیکی فاضلاب شهرک صنعتی در راکتور زیستی ناپیوسته منقطع با هوادهی متناوب. 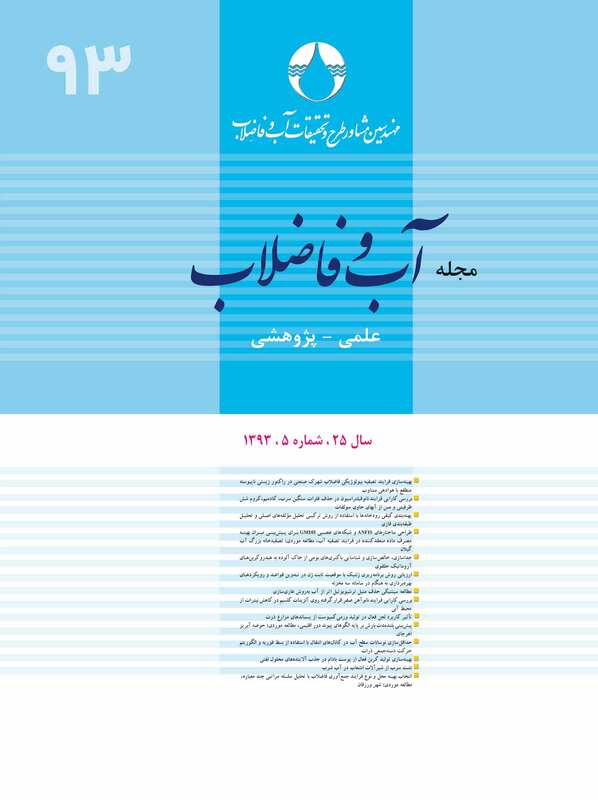 مجله آب و فاضلاب, 1394; 25(5): 2-12. در این مقاله، حذف همزمان کربن و مواد مغذی (نیتروژن و فسفر) از فاضلاب شهرک صنعتی فرامان در یک راکتور زیستی ناپیوسته منقطع با کنترل زمان هوادهی بررسی شد. آزمایش‌ها بر اساس طراحی ترکیب مرکزی (CCD) سازمان‌دهی و سپس با استفاده از روش پاسخ سطحی ((RSM، تحلیل شدند. زمان واکنش و زمان هوادهی به‌منظور تحلیل، مدل‌سازی و بهینه‌سازی فرایند انتخاب شدند و نه پارامتر وابسته به‌عنوان پاسخ‌های فرایندی اندازه‌گیری و محاسبه شدند. دامنه تغییرات زمان واکنش و زمان هوادهی به ترتیب 12 تا 36 ساعت و 40 تا 60 دقیقه بر ساعت انتخاب شد. زمان واکنش به‌عنوان مهم‌ترین متغیر شناخته شد که اثر کاهشی بر راندمان حذف کل اکسیژن شیمیایی مورد نیاز (TCOD)، سهم اکسیژن شیمیایی مورد نیاز با تجزیه‌پذیری بیولوژیکی آهسته sbCOD))، کل نیتروژن (TN) و کل فسفر (TP) نشان داد. شرایط بهینه عملکرد راکتور زیستی در زمان واکنش 12 تا 16 ساعت و زمان هوادهی 40 تا 60 دقیقه بر ساعت به‌دست آمد. In this paper, the simultaneous removal of carbon and nutrients (nitrogen and phosphorus) from Faraman’s industrial wastewater (FIW) in a time-based sequencing batch reactor (SBR) was investigated. The experiments were conducted based on a central composite design (CCD) and analyzed using the response surface methodology (RSM). Reaction and aeration times were selected for the purposes of analyzing, modeling, and optimizing the process. Nine dependent parameters were monitored as process responses. The region of exploration for the process was taken as the area enclosed by the boundaries of reaction time (12-36 h) and aeration time (40-60 min/h). Reaction time was found to be the most effective variable and showed a decreasing impact on the total chemical oxygen demand (TCOD), slowly-biodegradable chemical oxygen demand (sbCOD), total nitrogen (TN), and total phosphorus (TP) removal efficiencies. The optimum operating conditions were determined in the range of 12 to 16 h for the reaction time and 40 to 60 min/h for the aeration time. 1. Lim, S.J., Moon, R.K., Lee, W.G., Kwon, S., Park, B. G., and Chang, H.N. (2000). “Operation and modeling of bench-scale SBR for simultaneous removal of nitrogen and phosphorus using real wastewater.” Biotechnol. Bioprocess Eng., 5 (6), 441-448. 2. Khin, T., and Annachhatre, A.P. (2004). “Novel microbial nitrogen removal processes.” Biotechnol. Advancess., 22 (7), 519-532. 3. Kishida, N., Kim, J., Tsuneda, S., and Sudo, R. (2006). “Anaerobic/oxic/anoxic granular sludge process as an effective nutrient removal process utilizing denitrifying polyphosphate-accumulating organisms.” Water Res., 40(12), 2303-2310. 4. Zeng, R.J., Saunders, A.M., Yuan, Z., Blackall, L.L., and Keller, J. (2003). “Identification and comparison of aerobic and denitrifying polyphosphate accumulating organisms.” Biotechnol. Bioeng., 83(2), 397-404. 5. Agdag, O.N., and Sponza, D.T. (2005). “Anaerobic/aerobic treatment of municipal landfill leachate in sequential two-stage up-flow anaerobic sludge blanket reactor (UASB)/completely stirred tank reactor (CSTR) systems.” Process Biochem., 40(2), 895-902. 6. Zinatizadeh, A. A.L., Bashiri, H., Asadi, A., and Bonakdari, H. (2012). “Comparison of different fluid dynamics in activated sludge system for the treatment of a stimulated milk processing wastewater: Process analysis and optimization.” Korean J. Chem. Eng., DOI: 10.1007/s11814-012-0029-9. 7. Kapdan, I.K., and Alparslan, S. (2005). “Application of anaerobic–aerobic sequential system to real textile wastewater for color and COD removal.” Enzyme Microb. Technol., 36 (2-3), 273-279. 8. Najafpour, G.D., Zinatizadeh, A.A.L., and Lee, L.K. (2006). “Performance of a three-stage aerobic RBC reactor in food canning wastewater treatment.” Biochem. Eng. J., 30 (3), 297-302. 9. Pozo, R.D., and Diez, V. (2003). “Organic matter removal in combined anaerobic–aerobic fixed-film bioreactors.” Water Res., 37(15), 3561-3568. 10. Zinatizadeh, A.A.L., Mohamed, A.R., Abdullah, A.Z., Mashitah, M.D., Hasnain Isa, M., and Najafpour, G.D. (2006).“Process modeling and analysis of palm oil mill effluent treatment in an up-flow anaerobic sludge fixed film bioreactor using response surface methodology (RSM).” Water Res., 40(17), 3193-3208. 11. Irvine, R.L., Miller, G., and Bharmrah, A.S. (1979). “Sequencing biological reactor an overview.” J. of Water Pollutant Control of Fed., 51, 244-254. 12. Wilderer, P.A., Irvine, R.L., and Doellerer, J. (1996). “Sequencing batch reactor technology.” 1st International Specialized Conference on Sequencing Batch Reactor Technology, International Association on Water Quality, Germany, Munich. 13. Helimreich, B., Schreff, C. D., and Wilderer, P.A. (2000). “Full scale experiences with small sequencing batch reactor plants in Bavaria.” Water Sci. Technol., 41(1), 89-96. 14. Tchobanoglous, G., Burton, F., and Stensel, H.D. (2003). Wastewater engineering: Treatment and reuse, McGraw-Hill, New York. 15. Ahmadi, M., Vahabzadeh, F., Bonakdarpour, B., Mofarrah, E., and Maheranion, M. (2005). “Application of the central composite design and response surface methodology to the advanced treatment of olive oil processing wastewater using Fenton’s peroxidation.” J. Hazard. Mater., 123(1-3), 187-195. 16. Akhbari, A., Zinatizadeh, A.A.L., Mohammadi, P., Irandoust, M., and Mansouri, Y. (2011) “Process modeling and analysis of biological nutrients removal in an integrated RBC-AS system using response surface methodology.” Chem. Eng. J., 168 (1), 269-279. 17. Wang, G., Mu, Y., and Yu, H.Q. (2005). “Response surface analysis to evaluate the influence of pH, temperature and substrate concentration on the acidogenesis of sucrose-rich wastewater.” Biochem. Eng. J., 23(2), 175-184. 18. Asadi, A., and Ziantizadeh, A.A.L. (2011). “Statistical analysis and optimization of an aerobic SBR treating an industrial estate wastewater using response surface methodology (RSM).” Iranica Journal of Energy and Environment., 2 (4), 356-365. 19. Khuri, A.I., and Cornell, J. A. (1996). Response surfaces: Design and analyses, Marcel Dekker, New York. 20. A.P.H.A. (2005). Standard methods for the examination of water and wastewater, Washington. 21. Isika, M., and Sponza, D.T. (2006). “Biological treatment of acid dyeing wastewater using a sequential anaerobic/aerobic reactor system.” Enzyme Microb. Technol., 38(7), 887-892. 22. Dincern, A.R., Karakaya, N., Gunes, E., and Gunes, Y. (2008). “Removal of COD from oil recovery industry wastewater by the advanced oxidation processes (AOP) based on H2O2.” Global Nest., 10(1), 31-38. 23. Chan, Y.J., Chong, M.F., Law, Ch.L., and Hassell, D.G. (2009). “A review on anaerobic-aerobic treatment of industrial and municipal wastewater.” Chem. Eng. J., 155(1-2), 1-18. 24. Tay, J.H., Tay, S.T.L., Liu, Y., Show, K.Y., and Ivanov, V. (2006). Biogranulation technologies for wastewater treatment, Elsevier, Singapore. 25- Parkin, G.F., and McCarty, P.L. (1981). “A comparison of the characteristics of soluble organic nitrogen in untreated and activated sludge treated wastewaters.” Water Res., 15 (1), 139-149. 26. Li, J., Healy, M.G., Zhan, X., Norton, D., and Rodgers, M. (2008). “Effect of aeration rate on nutrient removal from slaughterhouse wastewater in intermittently aerated sequencing batch reactors.” Water, Air and Soil Pollut., 192 (1-4), 251-261. 27. Agathos, N.S., and Reneke, W. (2003). Biotechnology for environment: Wastewater treatment and modeling waste gas, Kluwer Academic Publisher, Dordrecht. 28. Chang, H.N., Moon, R.K., Park, B.G., Lim, S.J., Choi, D.W., Lee, W.G., Song, S.L., and Ahn, Y.H. (2000). “Simulation of sequential batch reactor (SBR) operation for simultaneous removal of nitrogen and phosphorus.” Bioprocess Eng., 23 (5), 513-521.